Ask The Bellwether: Who is Crosspatch Creations? Crosspatch Creations "is" my good friend Joan Contraman. She makes her home in Corvallis, Montana with her husband Don, various pets, and a herd of amazing sheep. 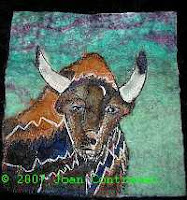 Joan raises sheep, primarily CVM (California Variegated Mutant), hand-dyes wool, silk, viscose, silk noil and other fibers, designs amazing Rainbow Rovings and Triple-Play Rovings to be carded in a USA mill, and cards her own Signature Batts. 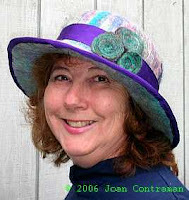 She is an accomplished fiber artist -- the hat in the photo is her own creation, from her Signature Batts. Joan is happy to be the first "interview" here on Ask The Bellwether. And here's a nod to Fiber Femmes, whose questionnaire for their webring inspired these questions. <thebelle>: Do you raise fiber animals? <Joan>: I started Crosspatch Creations, because I learned that having sheep is like eating potato chips – you can have just a few. When we moved to Montana 12 years ago, I told my husband that I would have a small spinner’s flock for myself … about 3 to 5. I now have over 100 adults and raise between 75 to 125 babies every year. So, to help with their feed, shearing, vet bills, etc. I started Crosspatch Creations. Now, I not only get to nurture the animals I love, I get to share them with other spinners across the country through their wool. <thebelle>: What's your favorite fiber? <Joan>: My favorite fiber is wool. I like to spin different breeds, hence I have a very eclectic flock. I raise everything from Romney though to Merino. I have experimented with Romeldales and do a lot of crossing with Corriedales. I’m playing genetically with both the feel of the wool, as well as color and patterns. I have badger and clown faced sheep, moorit, all shades of gray and now I’m working with spots. I love lambing just to see what my different pairings will produce. <thebelle>: What's your least favorite fiber? <Joan>: My least favorite fiber used to be cotton. But now that I have a Bosworth Charka – I love spinning it! So, I would have to say my lease favorite fibers would be synthetics. <thebelle>: What's your worst fiber habit? <Joan>: My worst fiber habit has to be having it all over the house. As much as I try to keep it in my studio – it seems to creep into every room! My picker is in our shed off our barn, my carder is in my studio in the basement, my wool drying racks are in our kitchen, the dyed bags of wool are by the back door ready to be taken out to the picker and the bags of processed wool is usually on our sofa about to be shipped to our retailers. I have a very patient husband! <thebelle>: In what ways does your fiber habit make you a better person? <Joan>: Having Crosspatch Creations as a business allows me to share my fiber habit with other spinners. When I was a vendor at shows, I met such wonderful people. It was so good for me to hear what other spinners felt about my fiber and color combinations. Now that the business is wholesale, I miss this immediate feedback. However, I love getting e-mails from other spinners who have spun my blends and get their input. The nice notes really help after I have been working at the carder for hours on end. <thebelle>: How would your life be different if you had to give up fiber? <Joan>: I can’t imagine giving up raising sheep. I am so lucky work at a job and be able to do what I have always wanted to – raise sheep! Having grown up as a “city girl” from the Los Angeles Area – I always felt I was out-of-place. I started spinning 35 years ago and from the very first time the wheel turned, it was my goal to take my craft from the actual animal through to a garment. Now, I can do that. It is so very rewarding to know the sheep personally, who went into a jacket or vest. 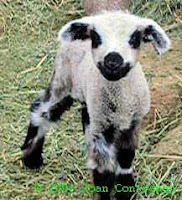 I even have special blends for some of my most favorite sheep – like My Beloved (for my all time favorite sheep – Arnold). The other thing that I have learned about raising sheep is that they have much more of a personality than people give them credit. I have found that if you are quiet and gentle around them – most respond. I was shocked the first time I was sitting out on my hill with my ewes and one came over to me and lay her head in my lap! No sheep book I have ever read talk about this aspect of sheep. Not all are friendly, but a portion of your flock will be. I have one ewe, Catherine, who likes to meet people by licking them. Also, some sheep just name themselves. I have a 3 year old ewe named Pandora – can you guess her personality? <thebelle>: What tools, yarns, books or gadgets can't you live without? <Joan>: We have fires a lot in Montana. And I have thought about what I would take, if we were every evacuated … and knock wood – that we never are. If I had to pack up – it would be my spinning wheels and looms that would have to be moved out. I have several Rick Reeves spinning wheels, an old Harris loom and a beautiful Fireside loom. These could not be replaced! <thebelle>: Who are your fiber mentors? <Joan>: My fiber mentors are Rick Reeves and Paula Simmons. I am a self taught spinner. When I first learned to spin, I could not find a teacher, so Paula Simmon’s books were my very first introduction to spinning. I first met Rick Reeves at a conference in California. His wheels are both a work of art and a true joy to spin on. First I became a collector of his wheels and later I was one of his dealers. <thebelle>: Are you a member of any guilds? <Joan>: I am a member of the Knotty Knitters, The Missoula Weavers Guild and the Montana Association of Weavers and Spinners. <thebelle>: What's the most exciting fiber project you've undertaken? <Joan>: I love spinning and weaving wearables. Several years ago I knit a Fair Isle sweater from handspun yarn. I also made a handspun, quilted jacket several years ago and am currently spinning cotton for a summer top. <thebelle>: How many people have you mentored? In which fiber arts? <thebelle>: Are fiber crafts an avocation or a vocation for you? <Joan>: Fiber crafts was first an avocation for me and now both an avocation and a vocation. Aren’t I lucky! <thebelle>: Do you consider fiber crafts to be functional or artistic? <Joan>: Fiber Crafts are both functional and artistic for me. Functional, because I’m primarily interested in making clothing and household items that will be used. Artistic, in their design. <thebelle>: My thanks to Joan! You can read more about her and Crosspatch Creations on her website. Her fibers, knitting patterns, and spinning kits are available at The Bellwether. Is there a fiber artist you'd like to hear more about? Let me know. Remember, "it never hurts to ask!" Put your requests in the blog comments or contact me. Thanks!